Release Date: 2001 Running Time: 52 mins. 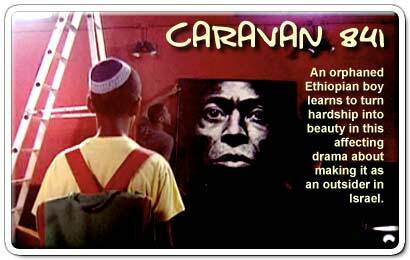 A wondrous coming-of-age story that relates the hope of a young boy amid the tragedy of Ethiopian Jews’ struggle in leaving their war-torn country, Caravan 841 weaves a tale of a young orphan looking to find his place and his self in his new home of Israel. Moshe, a little boy who immigrated to Israel from Ethiopia as a refugee with so many others in the 1990s, anxiously awaits his mother’s arrival – and endeavors to find his way without her. “I’ve gotta run like a fugitive to live the life I live,” one of Moshe’s few friends serenades him with Bob Marley’s lyrics, singing, as he dances about, “I’m going to be iron, like a lion in Zion.” With big innocent eyes and long skinny legs, Moshe appears vulnerable, but the repeated tests of his inner strength of character prove that the little boy has a lion’s spirit. Caravan 841 is the story of a boy who’s forced to realize all too soon that the world is cruel and unfair. Life gives Moshe one disappointment after another, but he works through them when he befriends a pair of role models who couldn’t be more different: a strict Orthodox Rabbi and an easy-going saxophone player who owns a night club. The compassionate strangers take a sincere interest in Moshe, but guide him in different directions: while the Rabbi encourages him to pray, study, and live dutifully, his musician friend, Walter, gives him opportunities to laugh, dance and make music — leaving Moshe to choose between them and find his own path. Orphaned and lonely, Moshe desperately wants something stable to believe in, but after being repeatedly hurt, he’s instinctively distrustful. The Rabbi tells him to trust in God: God, he says, will give him all he needs. Walter, on the other hand, tells Moshe to trust in himself. Recognizing Moshe’s strong will, bravery and independence, Walter knows that a little boy who grew up in Ethiopia and lost his father to murderers in Sudan already knows a great deal about the world and simply needs to trust in the knowledge he has. The emotionally-rich film is a true work of art, with gorgeous cinematography and passionate music. Caravn 841 opens with a beautiful shot of Moshe running through a field of sunflowers; it’s early in the morning, so the sun’s warm rays offer lighting that’s still soft and non-abrasive. Songs by Bob Marley and Billie Holiday make for a first-class soundtrack that’s highlighted by the beautiful live performances given in Walter’s night club. Caravn 841 explores what life in Israel is like as an outsider. Although he’s Jewish, Moshe obviously wasn’t raised with a thorough understanding of the religion or culture. Jewish prayers and traditions are slightly foreign to him, and when the Rabbi decides Moshe should be circumcised, the boy, unfamiliar with the practice, runs away terrified. Ultimately, the film speaks to the importance of emotional strength. An insensitive social worker looms throughout the film, threatening to send Moshe away to boarding school. While she and Moshe are sitting in her office, she reminds him, “You’re not the only child in Israel without a mother.” As harsh as these words are, she is right. Everyone has hardships they must face; what separates one man from the next is the grace with which he handles his struggles. As the Rabbi tells Moshe, “God is testing us from above all the time.” Life’s turmoil, he suggests, is all a test of character. Like Billie Holiday’s heavy-hearted songs playing in the background, Moshe’s story offers a message of hope – that heartache can be made into something good and meaningful. Moshe accepts his hardships with a stoic attitude and learns from those around him, making something beautiful from the difficult life he’s been handed.